Who was the best fighter pilot ever? What did it take to become a part of this exclusive top fighter pilots group? Actually, the numbers are not exact, but in general for a pilot to turn into flying ace it took five victories in a dogfight. Those statistics also served as a great tool (arguably, as considered unfair by e.g. bomber pilots) to boost competition among fighter pilots and lift morale during wartime. Known as “Red Baron” Manfred von Richthofen, a German fighter pilot, earned the Flying Ace title with the official number of eighty kills. He is considered to be the best fighter pilot of World War I. He was born in 1892, grew up in Silesia (Poland). He started in reconnaissance flights and then as a bomber. He used to hunt with his brothers during childhood, and it came time to awake the instinct again but in the airfield. After passing needed examinations in 1916 he joined Kampfgeschwader 2. Finally he was recruited by another great fighter ace Oswald Boelcke and joined his group Jasta 2. As a distinguished fighter pilot he became a leader of Jasta 11. His 16th aerial victory gave him the Pour le Mérite (the Blue Max) award. Soon after, he organized a unit known as “Flying Circus”. His trademark was all-red Fokker Triplane. Red Baron’s last victory was number 80. His last dogfight brings some confusion, as no one really knows who shot down the greatest fighter ace of the WWI. Interesting fact is that most of Richthofen’s claimed kills can be matched with exact British losses. Less than two decades later WWII burst out. 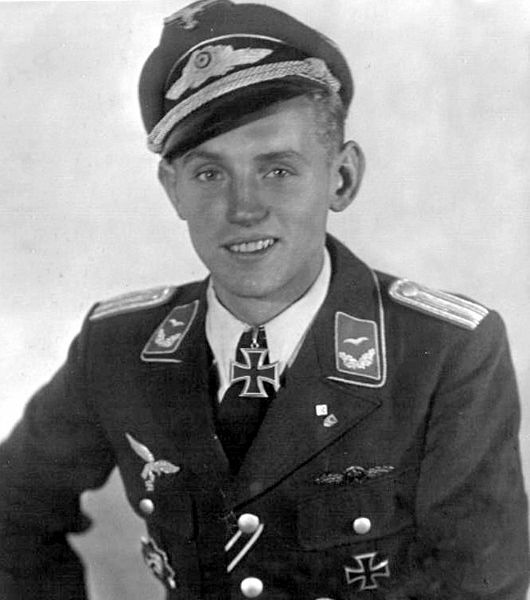 And came time for a young glider pilot Erich Hartmann (Eric Hartman). “Bubi”, a nickname by more experienced fighter pilots when he joined Luftwaffe in 1940 (at the age of 18) or the “Black Devil” as Soviet counterparts used to call him. After 1,404 combat missions and 825 engagements in dogfights he claimed 352 victories – the number never achieved by any other fighter pilot. This stunning comparing to other nations’ statistics put Hartmann in the Ace of Aces category. Having spent his early childhood in China he was sent back with his mother to Germany in 1928 when revolutionary slogans against “foreign devil” started to aggravate their life. Hartmann started as a glider pilot and finally got his pilot license in 1939 which enabled him to fly powered aircrafts. An important role in the life of the young Hartmann played Walter Krupinski, an already famous and one of the top fighter pilots in German Luftwaffe. Hartmann was Krupinski’s wingman. That was the time for him to develop his skills, and it wasn’t from day one that Hartmann was adding kills consistently to his tally but he definitely was a great pilot. After a while, Hartman started scoring over and over again. Developed his own technique which was to get exceptionally close to the enemy’s aircraft and shoot without wasting round. The hit was guaranteed when, as he would say, the enemy aircraft filled the entire cockpit window. His black tulip sign on his Messerschmitt Bf 109 was widely recognized, often leaving Hartmann with zero score as many didn’t want to engage in dogfight with him. Use head, no muscles to fly – as his motto, seemed to work perfectly. Although coming too close to the enemy was quite risky as meant flying through debris of destroyed aircraft, Hartmann always appraised the situation and possible damages and tried not to engage in one after one combat. He truly relied on his Messerschmitt Bf 109 power and its high velocity cannons. It is only possible to see the Messerschmitt Bf 109 in the museum nowadays. It is definitely one of the best combat machines. In service from 1939 to 1945 it “brought up” the greatest fighter pilots in military history. Currently it is not possible to fly this warbird. But there are more modern aircrafts available for one to feel like a pilot for a day and take control over a fighter jet. One could try more modern aircrafts as Aero L-39 Albatros, the Hawker Hunter or even the Supersonic MiG-29 Fighter Jet. The experience is equally exhilarating. Is Hartmann the best pilot ever? He stands in line with many others for multiple different reasons but with no doubt he is one of the top fighter pilots ever. Flying Ace list is long but he certainly earned his position on it. Based on his biography he was a truly modest man, especially proud of the fact that he never lost his wingman. Another point – have you ever heard about Stalin offering cash reward for shooting down an enemy ace…?